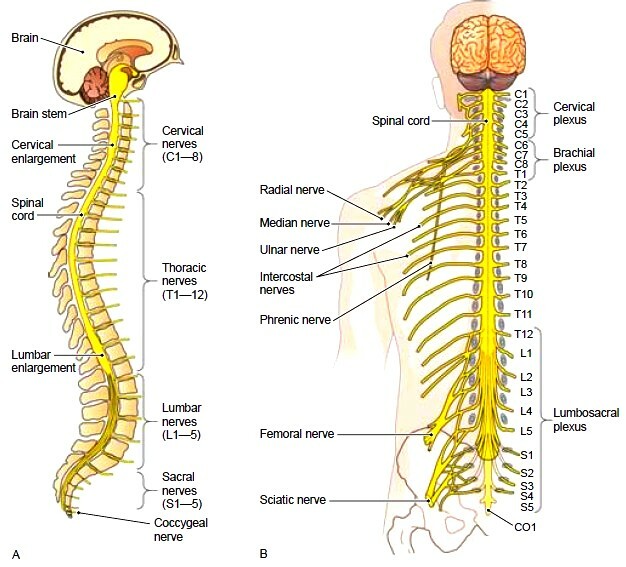 Figure 5-11 Spinal cord and spinal nerves. Nerve plexuses (networks) are shown. (A) Lateral view. (B) Posterior view. Figure 5-12 The spinal cord. (A) Cross-section of the spinal cord showing the organization of the gray and white matter. The roots of the spinal nerves are also shown. (B) Microscopic view of the spinal cord in cross-section (x5). There are 31 pairs of spinal nerves, each pair numbered according to the level of the spinal cord from which it arises (see Fig. 5-11). Each nerve is attached to the spinal cord by two roots: the dorsal root and the ventral root (see Fig. 5-12). 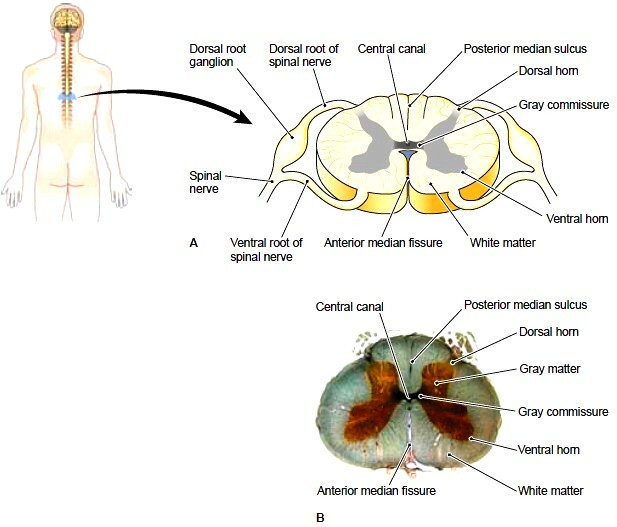 On each dorsal root is a marked swelling of gray matter called the dorsal root ganglion, which contains the cell bodies of the sensory neurons. A ganglion is any collection of nerve cell bodies located outside the CNS. Fibers from sensory receptors throughout the body lead to these dorsal root ganglia. The ventral roots of the spinal nerves are a combination of motor (efferent) fibers that supply muscles and glands (effectors). The cell bodies of these neurons are located in the ventral gray matter (ventral horns) of the cord. Because the dorsal (sensory) and ventral (motor) roots are combined to form the spinal nerve, all spinal nerves are mixed nerves. * The cervical plexus supplies motor impulses to the muscles of the neck and receives sensory impulses from the neck and the back of the head. The phrenic nerve, which activates the diaphragm, arises from this plexus. * The brachial plexus sends numerous branches to the shoulder, arm, forearm, wrist, and hand. The radial nerve emerges from the brachial plexus. * The lumbosacral plexus supplies nerves to the pelvis and legs. The largest branch in this plexus is the sciatic nerve, which leaves the dorsal part of the pelvis, passes beneath the gluteus maximus muscle, and extends down the back of the thigh. At its beginning, it is nearly 1 inch thick, but it soon branches to the thigh muscles; near the knee, it forms two subdivisions that supply the leg and the foot. Dermatomes Sensory neurons from all over the skin, except for the skin of the face and scalp, feed information into the spinal cord through the spinal nerves. The skin surface can be mapped into distinct regions that are supplied by a single spinal nerve. 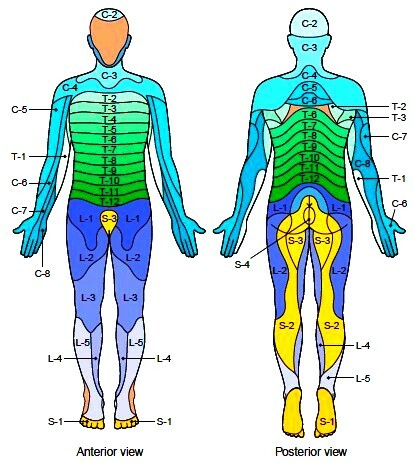 Each of these regions is called a dermatome (Fig. 5-15). Sensation from a given dermatome is carried over its corresponding spinal nerve. This information can be used to identify the spinal nerve or spinal segment that is involved in an injury. In some areas, the dermatomes are not absolutely distinct. Some dermatomes may share a nerve supply with neighboring regions. For this reason, it is necessary to numb several adjacent dermatomes to achieve successful anesthesia. Figure 5-15 Dermatomes. A dermatome is a region of the skin supplied by a single spinal nerve. nerves, most commonly the intercostal nerves, which are branches of the thoracic spinal nerves in the waist area. It is caused by a reactivation of a prior infection by the chickenpox virus and involves an attack on the sensory cell bodies inside the spinal ganglia. Initial symptoms include fever and pain, followed in 2 to 4 weeks by the appearance of vesicles (fluid-filled skin lesions). The drainage from these vesicles contains highly contagious liquid. The neuralgic pains may persist for years and can be distressing. This infection may also involve the first branch of the fifth cranial nerve and cause pain in the eyeball and surrounding tissues. Early treatment of a recurrent attack with antiviral drugs may reduce the neuralgia. Guillain-Barre syndrome is classified as a polyneuropathy that is, a disorder involving many nerves. There is progressive muscle weakness due to loss of myelin, with numbness and paralysis, which may involve the breathing muscles. Sometimes the autonomic nervous system is involved, resulting in problems with involuntary functions. The cause of Guillain-Barre syndrome is not known, but it often follows an infection, usually a viral infection. It may result from an abnormal immune response to one’s own nerve tissue. Most people recover completely from the disease with time, but recovery may take months or even years. Contacts: lubopitno_bg@abv.bg www.encyclopedia.lubopitko-bg.com Corporation. All rights reserved. DON'T FORGET - KNOWLEDGE IS EVERYTHING!